The fading glow of a "zombie" star reveals that its body remains plenty active, as seen in an incredible rotation rate. The very old star has a dead heart, having exhausted all the fuel that runs thermonuclear fusion. But the star itself goes on spinning about its axis once every 2.6 seconds and generating intense magnetic fields. The term zombie was applied by researchers associated with the work, in a statement today. The more scientific term is Soft Gamma-ray Repeaters (SGRs). There are only five known, four in the Milky Way Galaxy and one in a nearby satellite galaxy, the Large Magellanic Cloud. Each of these strange beasts is between roughly 6 and 20 miles in diameter (10 to 30 km), yet contains about twice the mass of the sun. They're part of a larger class of dead, collapsed stars known as neutron stars. What sets the Soft Gamma-ray Repeaters apart from other neutron stars is that they possess magnetic fields that are up to 1,000 times stronger. This has led astronomers to call them magnetars. Oh, and they are incredible powerful: One of them erupted so wildly that in 2005 (our time) the explosion briefly altered Earth's upper atmosphere, even though the star is 50,000 light-year away. The object of study, SGR 1627-41, was discovered in 1998 by NASA's Compton Gamma Ray Observatory when it burst into life emitting around a hundred short flares during a six-week period. It then faded before X-ray telescopes could measure its rotation rate. 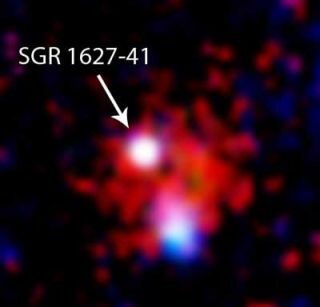 So until now, SGR 1627-41 was the only magnetar whose period was unknown. Last summer, SGR 1627-41 flared back into life, and ESA's XMM-Newton telescope caught the fading afterglow in September, allowing the new measurements. "This makes it the second fastest rotating magnetar known," says Sandro Mereghetti, INAF/Istituto di Astrofisica Spaziale e Fisica Cosmica, Milan, one of the team. Theorists are still puzzling over how these objects can have such strong magnetic fields. One idea is that they are initially, upon collapse, spinning very quickly, at an incredible rate of once every 2-3 milliseconds. The rapid rotation of a new-born magnetar, combined with convection patterns in its interior, gives it a highly efficient dynamo, which builds up such an enormous field, the thinking goes. The spinning then slows over time. So, the thinking continues, with a rotation rate of 2.6 seconds, this magnetar must be old enough to have slowed down. Another clue to the magnetar's age is that it is still surrounded by a supernova remnant. During the measurement of its rotation rate, XMM-Newton also detected X-rays coming from the debris of an exploded star, possibly the same one that created the magnetar. "These usually fade to invisibility after a few tens of thousand years. The fact that we still see this one means it is probably only a few thousand years old," Mereghetti said. If it flares again, the team plan to re-measure its rotation rate. Any difference will tell them how quickly the object is decelerating. There is also the chance that SGR 1627-41 will release a giant flare. Only three such events have been seen in the last 30 years, on other stars. These superflares can slam Earth with as much energy as a flare from the sun, even though they are halfway across the galaxy, the researchers said. "These are intriguing objects; we have much still to learn about them," Mereghetti said.